I just spent several days at the Do Lectures, a magical event in Wales with the motto “ideas + energy = change”. We talked a lot about the process of bringing ideas to life, and the barriers that stand in the way. A physician and technologist named Mohammed Al-Ubaydli shared the concept of “Trojan mice”, which I found inspiring for anyone trying to introduce ideas to an organization or a market. Mohammad Al-Ubaydli founded a company called Patients Know Best to allow patients to take control of their health records. It was a great idea, but he knew he would face serious obstacles from risk-adverse hospitals and the medical community. So, rather than pursue the initiative all at once, he introduced Trojan mice, small-start slivers of the big idea. He approached one hospital and offered simple communication tools to patients. When the hospital saw immediate positive response from these simple tools, they started to ask for more. Before long, Mohammad had implemented the entire idea. Not from the top down, but from the bottom up. Good to see you and have the opportunity to chat this week at the Do Lectures. I too was very struck by the ‘Trojan Mice’ concept. I’d like to think that we ourselves are now ‘Trojan Mice’ as a result of these inspiring few days. That is, even as individuals, we can profoundly affect our own professions, specialisms and organisations and ‘be the change we want to see’ because of what we have heard from all the fantastic speakers. I like the idea that the Trojan Mice contain something bigger than a Trojan Horse! 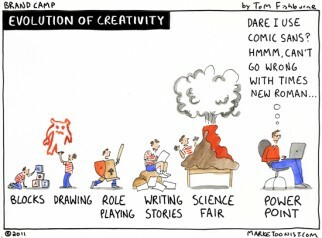 The idea of “trojan mice” exactly lines up with the idea of driving change and improvement over the long view. When doing continuous improvement, the notion of doing many small changes, to create a bigger change in the end, almost always results in better adoption, more effective change management, and lower risk in implementation. It’s a great term and I’ll adopt the metaphor for my work. 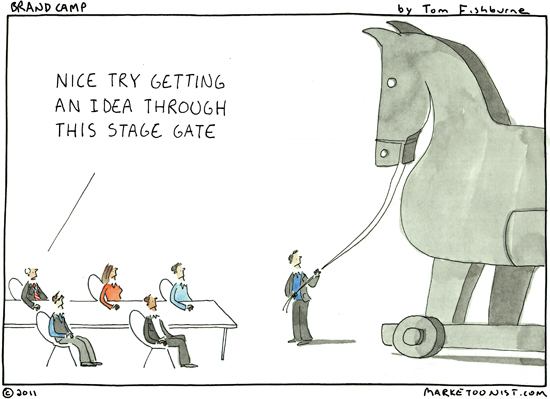 BTW, nice use of a “trojan horse” cartoon to lure readers into reading a really insightful post! Talk about a modern day Odysseus! The ‘Trojan Mice’ concept seems perfect for technology investments that can be scaled cost effectively. I’ve seen Healthcare RFID Tracking companies do this very effectively. The initial “mouse” involves selling in the basic infrastructure to track medical devices. Once the hospital has done this, the incremental effort and cost to get more benefit out of the infrastructure is significanlty less. Before they know it there are “mouse droppings” all over the hospital as they track beds, patients, and staff. Great term for the continuous improvement processes from over 20 years ago. Might be a great way to bring younger workers into the mindset that you don’t need to change the world overnight, but work in the right direction a little bit at a time. Change does not have to be difficult. When people WANT the next step, you create momentum. I find the concept intreresting and inspiring. This sounds similar to the MVP (minimum viable product) concept. You build something very small, you try it and learn from it, and continue to improve it. Great comments all around. Sorry it took me a couple extra days, but I’m traveling this week. This week’s cartoon goes to Jeff. I love the Healthcare RFID case study and the corollary of “mouse droppings”.